Charles William Beebe was born on July 29, 1877 in Brooklyn, New York. His father, Charles Beebe, was a paper dealer and was frequently away from home. When Beebe was 2 the family moved to East Orange, New Jersey, away from New York City, which his mother, Henrietta Younglove Beebe, found stifling. The family often took the train into New York City to visit the American Museum of Natural History where they attended lectures. Young Beebe often explored the wilderness around his family home and was an avid collector of animals and insects that he found there. Beebe attended East Orange High School and in 1896 he entered Columbia University in New York City. At Columbia he studied under Henry Osborn. Beebe did not complete his degree at Columbia, finishing all the classes neccessary for a degree except mathematics, and instead he took a job as the assistant curator of ornithology at the new New York Zoological Park, what is now the Bronx Zoo. As assistant curator Beebe's job was to breed and rear the birds in the zoo's collection. Beebe wanted to give his avian charges the most space possible and so he proposed a "flying cage" the size of a football field, which was built, but only at half the size of his proposal. In 1901 he was part of expedition to Nova Scotia to collect marine animals for the zoo and the following year he was promoted to be a full curator. In 1903 Beebe took an expedition to the Florida keys. Suffering from a throat infection and it was thought that the expedition to the tropics would be beneficial. The expedition fueled Beebe's interest in the wildlife found in the tropics and was the first of many that he would make during his life. Over the next several years Beebe made many expeditions to collect birds traveling to Mexico, British Guiana, Trinidad, Venezuela, and in 1909 he traveled to the far east on a 17 month expedition, visiting 21 countries and gathering material for a monograph on pheasants. Although the manuscript was completed by 1914, Beebe was fastidious in his desire to have excellent illustrations of the birds. Because of this and the outbreak of World War I the first volume (of four) was not published for 4 more years. 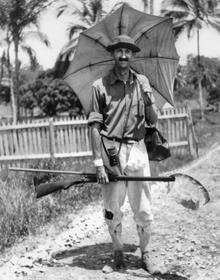 In 1915 Beebe traveled to Brazil to obtain more birds for the zoo. The expedition was an important turning point for Beebe as his focus began to change from simply ornithology to studying jungle ecosystems. After briefly serving as an aviation instructor for the American war effort, in 1918 Beebe began a series of expeditions including the Galapagos islands, the Sargasso Sea, and Haiti. Over the years Beebe's focus widened from just ornithology to study other areas of biology and oceanography. One of Beebe's most important contributions to the study of birds was the theory that the ancestors of modern birds had passed through a stage he referred to as the "tetraptrex" stage where the ancestral birds had four wings on both their fore and hind limbs. This theory was later verified by fossil evidence. Beebe is probably most famous for his part in the development of the bathysphere. At the time deep sea diving was only possible in heavy and not very movable diving suits. Working with engineer Otis Barton, Beebe developed the bathysphere, an unpowered, spherical shell that was lowered from a ship by means of a cable and ocean life could be viewed through the quartz windows embedded in the side of the sphere. Using the bathysphere they had developed, Beebe and Otis set a world record on a half mile dive in 1934 of off Nonsuch Island in Bermuda. Beebe retired in 1952 at the age of 75. Beebe died on June 4, 1962 in Simla, India and was buried in Trinidad.